It's Week 2 of the Tetris Quilt-A-Long!!!! I am so excited to see how many people joined in with week 1. If your new, great were so glad to have you!!! So let's get to week 2!! 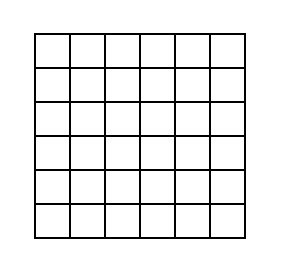 Now you just fill in your grid with your pieces. There were a lot of people who mentioned they wanted to continue their blocks from last week into this week. For example, my Orange square that cut off last week would continue into the bottom of this weeks grid :) That's totally fine. You can do whatever makes you happy. And Don't forget to add your Week 2 Block to the Happy Quilting Quilt-A-Long Flickr group!!! (There will be some giveaways there too, I'm just saying :) I am so excited to see everyone's Week 2 block!!! Woo hoo! I've been waiting for week two! Getting on that later today! Can I make week 2 be next to week 1, instead of on top? That would make week 3 on top of week. Hurray for week two! I love how yours worked out! That's adventurous putting the purple square over to the next block! I was randomly wondering about your flickr fiasco, how did that work out? I assume you got your info all fixed up. Thanks for all your hard work for this! Oh my!!!! I LOVE Birds and Bees. I nearly placed an order for it yesterday!! Thanks so much Melissa. I am loving this QAL. Now, onto Block 2. This is really fun and fast! My husband had to work today, so it gave me something to do on this state holiday. I stopped by this morning and got the colors and shapes and was surprised to see so many blocks on the Linky party already... now that I've done mine the Linky is missing. Is there something wrong with my computer? Love the sewing, and I've got #2 above #1 and since I'm keeping pieces intact it is really starting to look like the game. Okay, never mind the missing Linky. My computer just loads really slowly when the A/C is on. Sorry to bother you with it. So excited to see how different everyone's blocks are even following the same directions. This has to be one of the greatest QAL ideas ever! Thanks. Can't wait for next week! Everyone's blocks look great. I can't wait every week for Tuesday. I ran over a couple of my blocks from week 1. I think it will look great once they are all together. Thank you so much for hosting this. It's the first QAL I have done and it's a blast. My kids love it too! So fun! I love Tetris, so I just had to make a quilt for the quilt along. 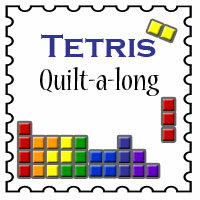 I am going to try to have my puzzle pieces run into the next blocks, so that all the pieces will be the Tetris shapes. Totally loving this... and it's the perfect amount of sewing to remind me to spend some me time without it being too much... and I accomplish something. Thanks for hosting this and looking forward to next week already! p.s. glad you found your camera and got back into flickr. What a relief! Everyone's blocks looks great. Although I see a lot of one-square white blocks, and there are not any one-square pieces in tetris. Everyone's blocks look fantastic. This is so fun!! Came in just under the wire! I am caught up now. I decided to use black for my background because Tetris I have played is black or blue and I like how it offsets the brighter fabrics I used. Made it just in time again this week. I suppose that's what happens when you have 3 kids, and one of them is an infant.